LET har annonsert en ny turnering i Sør-Afrika. Det er gode nyheter for damene. Etter turen til Australia med fire turneringer med start 1. februar går turen nå rett videre til Sør-Afrika. Her spilles the Investec South African Women’s Open at Atlantic Beach Country Club i Cape Town. LET har ikke vært i Sør-Afrika siden 2014. I det året vant MArianne Skarpnord South African Women's Open. CAPE TOWN, 15 January 2018 – The Investec South African Women’s Open is set to return to the Ladies European Tour schedule thanks to a new agreement with the Sunshine Ladies Tour and the Women’s PGA of South Africa (WPGA). After the 2018 LET season tees off on 1st February with an Australian swing comprising the Oates Vic Open, ActewAGL Canberra Classic, Australian Ladies Classic – Bonville and the Women’s New South Wales Open, the LET will head straight to Cape Town for the Investec South African Women’s Open at Atlantic Beach Country Club, from 8-10 March. 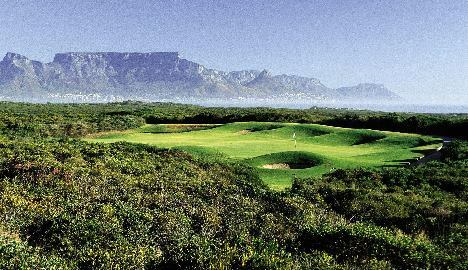 Atlantic Beach Country Club boasts an 18-hole championship links-style golf course, set in what is arguably the most magnificent location in Cape Town, with spectacular views across the Atlantic Ocean and the historic Robben Island through to Table Mountain. The tournament will mark the LET’s first visit to South Africa since 2014, when the championship was held at San Lameer Country Club in KwaZulu-Natal. “The Ladies European Tour is delighted to co-sanction this tournament with the Sunshine Ladies Tour and pleased to offer our members at least five playing opportunities within a six-week period early in 2018,” said the LET chairman, Mark Lichtenhein. “South Africa is a proud sporting nation which has produced some of the world’s leading golfers and we would like to say a huge thank you to the Sunshine Ladies Tour for welcoming our international competitors, as well as to Investec for their support as title sponsor. Sunshine Tour Chief Executive Selwyn Nathan commented: “We are delighted to announce that the LET will be a full co-sanctioning partner to this year’s Investec South African Women’s Open. The Sunshine Ladies Tour and the WPGA are extremely excited to welcome back the LET for the first time since the 2014 SA Women’s Open. The prize money earned in the prestigious championship will count towards both the Investec Property Fund Order of Merit and the Ladies European Tour Order of Merit. The winner will receive full membership of the LET until the end of 2019. “We are absolutely delighted with the confirmation from the LET,” said Danni Dixon, head of Marketing for Investec Property. “Following our initial investment in the Sunshine Ladies Tour to aid the promotion and growth of South African women’s golf, both locally and internationally, we decided to take up the title sponsorship of the South African Women’s Open this year. The tournament will mark the Ladies European Tour’s first visit to South Africa since 2014, when three-time champion Lee-Anne Pace from South Africa prevailed in a play-off against Holly Clyburn from England to lift her first of three titles at San Lameer Country Club in KwaZulu-Natal. Cherise Paxinos and Liza Gröpp-Els, the co-chairpersons of the WPGA, lauded the initiative between the Sunshine Ladies Tour, the LET and promoter World Sports Promotions. “South Africa is known around the world as a fantastic golf destination and boasts several co-sanctioned and tri-sanctioned events on the Sunshine Tour,” said Paxinos. Liza Gröpp-Els added: “On behalf of our members, we thank Investec, the Sunshine Ladies Tour and the LET for investing in our national championship. We also want to applaud the City of Cape Town for embracing the South African Women’s Open and for throwing its full support behind the event. “The City of Cape Town joined the Sunshine Ladies Tour as the host sponsor of the annual Cape Town Ladies Open in 2015 and we were proud to play a key role in reviving the South African Women’s Masters last year, after an absence of eight years.